Music is the only form of communication Connor Owens controls. No matter how badly he wishes to fit in, friendly banter and casual conversations have never been his thing. College is yet another social universe he has no clue how to navigate—until he meets Jared, a football player with chestnut eyes and a cocky grin that holds the power to shatter his self-imposed prison. Jared’s attention opens Connor up to a new realm of emotional and physical intimacy. But as Connor’s self-confidence grows, so does his fear that everything will fall apart. Because in this socially stratified world, how long can a relationship between an introverted violinist and a closeted football player really last? Nope, I didn’t love this one. 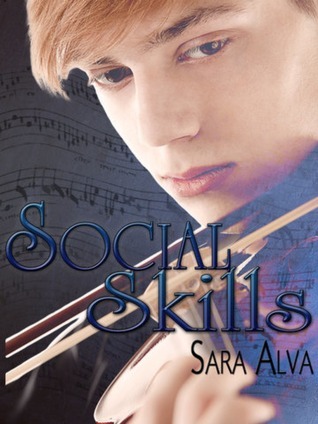 Social Skills is about introverted Connor and the changes he makes in college: the guy he falls for, the friends he makes, and the person he becomes. It’s YA and coming-of-age to the nth degree. The main features of this book would ordinarily move me, yet in this instance, they didn’t. What started off really well – with great, slow, character depiction and scene setting – became elusive and unjustified as soon as the second MC entered the picture. I saw no reason for sweet Connor to become so attached to Jared (other than the physical) and frankly found Jared’s character selfish, immature and undeserving of Connor’s affections. That’s not the kind of story I like to read. Connor’s friends (while being a great mix of people) were altogether too perfect in their colorful off-beat ways. Clearly everyone wants such fabulously diverse, smart, accepting friends, but their complete well, yes, perfection made it all a little to hard to swallow. On the other hand, reading about Connor’s relationship with his violin was really gorgeous. I enjoyed reading about the solace he gained while playing his instrument and I loved the way music was written into the story to calm and sooth Connor. Sara Alva has created a wonderful character in Connor. I would have gladly stayed alongside him in his journey – I just would have liked for him to end up with someone deeper and more deserving. I did love this one. Maybe because I was just such an introvert in college, and friends now and then with people trying to look cool on the outside, but it really struck a chord with me. It’s a favorite and a reread for me. I do agree that Connor’s friends are too great (oh how I wish, thirty years ago,…) I guess I sympathized with Jared’s struggles, and I understood Connor hitching his heart to someone like that. Jared was immature, but he was a college kid and that’s how they are. So this one resonated for me. This entry was posted on August 14, 2014 by Sue in Contemporary, Reviewer: Sue, YA / NA and tagged 3 Stars, sara alva, Self Published, YA.